You are here: Home / Freebies / Wedding Budget Planner. Free printable with personalized percentages. You are engaged, congratulations! Now you face the project of planning a wedding from start to finish. Or perhaps you are farther along in the process and feel you need to regroup. Either way, you want nothing falls through the cracks. Two tools can help jumpstart your planning: (1) A wedding planning checklist (click or tap here to go to ours) and (2) a wedding budget planner, which you will find below. A detailed budget goes a long way toward helping you decide where it’s most important to spend your money and where to cut back. And knowing up front how much you have for each item narrows your choices, reducing stress. 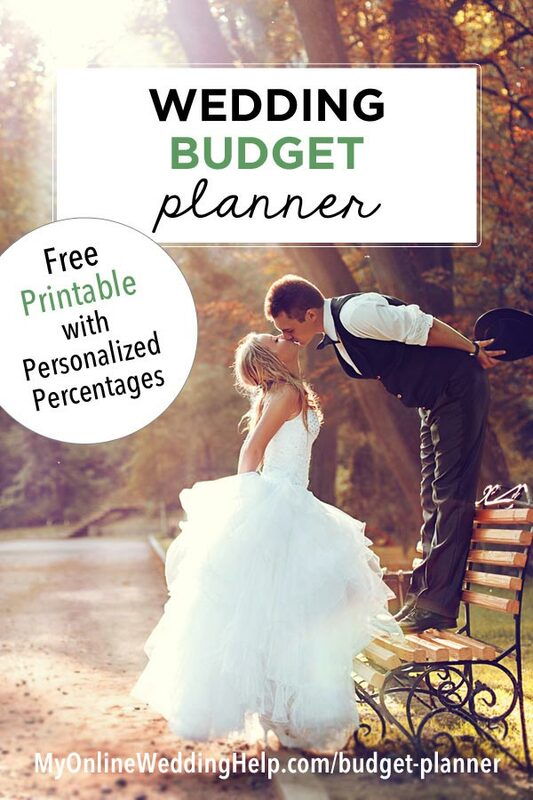 Generate your itemized budget with the wedding budget planner below. 1. Type in the amount you have to spend on your wedding as well as the number of wedding guests. 2. Review the preliminary figures. Because your wedding is unique, many line items will be too high or too low for your situation. 3. Redistribute your budget by adjusting the dollars in each line item. When the total over/under budget is close to zero and each item seems reasonable, the budget is complete! You can find ideas and current prices of items by clicking links you see throughout the budget. Also, you will see a helpful note or tip by each entry. You can keep these or replace them with your own comments. When finished, type your email address at the bottom to receive a permanent copy of your budget. There are 14 spending categories in the budget planner, along with a common range for each in the summary. But there is no reliable rule of thumb for what to spend where. You decide what works for your according to your priorities and situation. Click each category to go to the corresponding place in the budget.